ARJUN REDDY arrived at Box Office in style. It crossed premieres of many big stars and clocked $195k from just 78 locations which is a record of sorts. Per Location average is close to $2500, which is unbelievable. That’s just the start and it’s only going to set the box office on fire for next coming days as reviews are awesome. Just to make it even more sweeter there is a VISA Promo Code that you can use to BUY 1 TICKET AND GET 1 FREE. 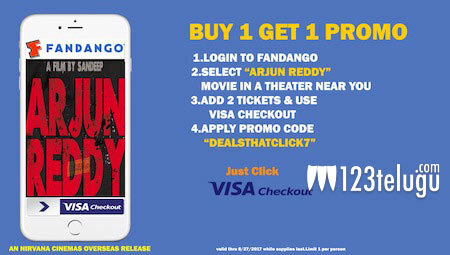 You can use this offer on almost all the theaters that we released our movie in. Please follow the below steps to get this offer. Hurry Up Offer Ends on 8/27.